GPS tracking systems have come a long way since being used to simply track your vehicles whereabouts. With the capabilities now available there are many different ways you can get a ROI while increasing the safety of your drivers and those they share the road with; driver coaching or audible alerts is something you definitely want to look for in your GPS solution. Driver coaching, which is also referred to as audible alerts, are alerts that occur inside the vehicle when drivers are driving in a way that wastes excessive fuel or put them at risk. These alerts are commonly used for speeding, hard braking or accelerating, harsh cornering and excessive idling. The driver coaching alerts usually work as a beeping function inside the vehicle in real-time so your drivers can correct the inappropriate behavior immediately. It is important that your software is reliable, secure, and can be customized to fit your fleet management requirements. You should be able to navigate around the software quickly and easily with very basic training. It’s important the software you choose does not require you to invest a ton of your time in learning how to use it but you also want to be able to learn to use it effectively to get the ROI you are looking for. You want to look for an easy to use system that is easy to install to avoid any downtime. 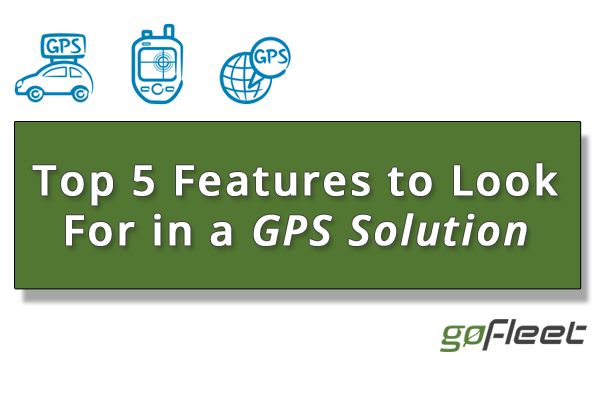 Data generated from any GPS fleet solution should contain meaningful insights to help make strong strategic decisions. Most applications provide practically unlimited data, but the way the data is analyzed can vary among different solutions. Along with basic reporting it is important to enable advance reporting to refine data based on your company’s preference and requirements. It is important to ensure that reports can be customized as well as accessible to compare multiple reports and measure performance. All solutions offer basic tracking; however it is important to differentiate among the type of tracking being offered. Real time tracking is the ability to view your entire fleet at a glance on a map, and the frequency of the data logged is a true reflection of how accurate the route is within the tracking software. Most applications are able to show you data but the route taken will not incorporate any turns, stops, detours etc. Instead it will record data from Point A to Point B; failing to take into account any important logs that occurred during the course of the route. Although an increase in logs may result in an increase of data usage, it is necessary to select a solution that is capable of providing accurate information without affecting data charges, helping to make necessary cuts & adjustments to improve efficiency. Advancements in technology require heavy investments in the long run. This means constant changes need to be made to keep up with industry requirements. Which is why, it is important to ensure that any solution chosen is scalable and capable of growing with your company’s needs. The device should have the capability of offering added flexibility and integration with third party providers. The IOX technology is a great place to start as it can: communicate with external serial devices, read digital ON-OFF signals and read analog signals, 0 to 30V. This way you can take advantage of powerful add-ons to future-proof your fleet. For more information on the important features of GPS fleet tracking, and how it could help your business save thousands of dollars, contact one of our highly trained fleet consultants today!